VIDEO: Anthony Joshua speaks Yoruba, says ‘pounded yam, eba secret of my success’ – Royal Times of Nigeria. 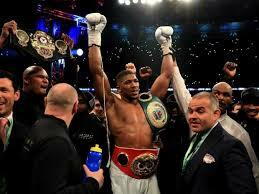 Shortly after his win against former champion Wladimir Klitschko, British Nigerian new champion, Anthony Olaseni Joshua has spoken on his connection with his roots, Nigeria. In an Interview with Chief Executive Officer of Sportbrand Limited Nigeria/Germany, Oma Akatugba, at the Laureus World Sports Awards, Anthony revealed his plan to give back to Nigeria if given the opportunity. He also attributed some of the strength he used in knocking Klitschko out to Nigerian foods like pounded yam and eba that he loves so much.